Germany's leading left daily wins the fight to name a street after a leader of the 1968 student movement. die Tageszeitung An image from the front page of the ‘taz,’ April 17, 1979. Several weeks ago, there was a small tremor in the German capital: four blocks of city street were renamed Rudi-Dutschke-Strasse, a gesture that honored the memory of a charismatic student leader and formally inscribed it into the urban landscape. It is no coincidence that this little strip of downtown street–once adjacent to the Berlin Wall–is also the address of Germany’s pugnacious left-wing daily, Die Tageszeitung (The Daily News), known to everyone in Germany simply as the taz, which will be celebrating its thirtieth birthday later this year, just as the hoopla attending the fortieth anniversary of the student uprising dies down. The campaign to name a street after the icon of West Germany’s 1967-69 student movement was pure Tageszeitung. The initiative was born in the paper’s editorial offices in 2004, and it prevailed only after fierce legal battles and a bitterly contested neighborhood referendum, which involved antagonists not entirely dissimilar to those of four decades earlier: Christian Democrats vigorously against, Greens and assorted lefties for. “Dutschke was the symbol of ’68, which had an enormous impact on modernizing and liberalizing the postwar Federal Republic,” explains editor in chief Bascha Mika from a sun-drenched picnic bench atop the taz‘s five-story home, a handsome turn-of-the-century, red-brick structure. “The student movement broke with the stuffy, conservative postwar ’50s and, critically, the way Germans thought about the Nazi past.” Although the taz‘s 200-person staff today contains a handful of grizzled ’68 veterans who marched alongside Dutschke, its ranks reflect the many protest movements that followed the ’60s: the women’s, the environmental, the Third World and the peace campaigns, among others. And there’s plenty of new blood at today’s taz, too, from the generation that was in diapers when West Germans occupied the streets in the 1980s to protest Pershing II missiles. It is also no coincidence that Rudi-Dutschke-Strasse runs from the taz to the base of a soaring glass-encased high-rise, the headquarters of the conservative Springer publishing empire, the arch-nemesis of the rebel students as well as German progressives ever since (and of taz readers, by definition). 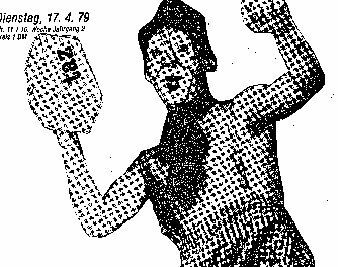 The student partisans of ’68 held the shrill Springer newspapers responsible for demonizing Dutschke and the movement. In April 1968, on one of West Berlin’s main streets, a right-wing extremist from Munich, with copies of Springer papers vilifying Dutschke on his person, pulled a pistol and shot him point-blank in the head and chest, critically wounding him. The shooting sparked riots and the siege of Springer facilities across the country. In West Berlin, rocks and Molotov cocktails rained on the Springerhaus; its delivery trucks were upended and set afire. Though Dutschke survived the assassination attempt, he died from attendant complications in 1979. But before he passed away, he had a hand in bringing to life two of the German left’s most important and enduring products: the Green Party and the Tageszeitung. Like the ’68ers, the newspaper aspired to mount a challenge to the Springer media empire and to business-as-usual in the republic–but by a different means. The taz has survived for three decades–against all odds and anyone’s predictions–in the face of dire financial crises; paralyzing internal political battles; and countless boycotts, occupations and physical attacks (unlike in Dutschke’s day, those assaults came not from the right but from factions in the left itself). Much changed from its early incarnation as a chaotic co-op and “voice of the social movements,” the thirty-two-page broadsheet has even become a respected and cherished part of the German media scene. Yet its unorthodox mix of high-end political analysis, in-your-face irreverence and cutting satire keep it in a class entirely its own. And unlike New York City’s fifty-three-year-old Village Voice, once a kindred countercultural spirit, the taz has remained irreverent without becoming irrelevant. Nearly 50,000 subscribers couldn’t imagine their morning coffee and musli without it. The idea of an independent, alternative daily had knocked around leftist circles for years before the harrowing German Autumn of 1977–the apex of the confrontation between the West German state and the urban guerrillas of the Red Army Faction–put planning into overdrive. In the charged political atmosphere of the day, explains taz co-founder and first editor in chief Thomas Hartmann, “it was nearly impossible for [West Germany’s] leftists to conduct a constructive discussion about the urban guerrilla phenomenon, on the one hand, and the state’s very authoritarian, heavy-handed response to it, on the other.” Hartmann came of age in Frankfurt’s anarchist milieu, where he had infiltrated factory floors and stoned the police with a young tough named Joschka Fischer. “We were shut out from the mainstream press and threatened–often physically–by the hard-line supporters of the armed factions,” he says. “There was very little space for us to talk about these events that affected us so directly.” The late ’70s was also the heyday of the New Social Movements, such as the women’s and the anti-nuclear power campaigns, which, despite mobilizing millions in Germany’s biggest civic movements ever, were also largely excluded from press coverage. The intent of the new daily was to avoid the sectarian disputes and dogmatism that had plagued the post-’68 New Left and to reflect the broad heterogeneity in the republic “left of the Social Democrats.” This included the adherents of the powerful social movements as well as anarcho Spontis, house squatters, gay and lesbian communities, anthroposophists, draft dodger associations, marijuana legalizers, anti-census groups and many others in the thriving bohemian alternative Szene that had emerged in urban and rural niches across the republic. Since 1973, French leftists had been reading Libération, which, to a certain extent, served as a model for the taz. The early taz saw its role as being Gegenöffentlichkeit, a “counter public discourse” that would both challenge and supplement the mainstream discourses. From its earliest days as a decentralized co-op with mostly unfunded writers and staff, the taz was riven by the diverse currents and the counterculture that it embodied. Would the paper be a platform of the social movements (and later the Greens) or of their engaged critics? Would it be a political actor or would it report and comment on the republic’s progressive activists? Would it aspire to the professional standards of the bourgeois media or play by its own rules? The knockdown-drag-out brawls during the early years are now the stuff of legend. In 1981 a weeklong strike of the paper’s female staff–a protest against the male-dominated hierarchy–nearly ground production to a halt. (The macho male ethic of the West German left was one of the student movement’s less flattering legacies.) The paper’s “Weapons for El Salvador” campaign during the 1980s pitted pacifists against those who felt justified in supporting the Marxist rebel movement fighting the US-backed junta with more than just verbal solidarity. The campaign netted the FMLN more than $2.5 million (funneled through Managua in plastic bags), the most successful left-oriented fund-raising venture of its kind in Germany. Much the same lines of confrontation were evident a decade later when military intervention in Bosnia split the German left, filling the taz‘s pages with opposing editorials and enraged readers’ letters. The taz, says Mika, can and will never be like the rest of the republic’s media. It is owned not by a private company but by a collective of nearly 8,000 private sponsors and the staff. Unlike every other German daily, it lives primarily off the sale of the paper, not advertisements. “We simply can’t be blackmailed,” says Mika. Today staff members are paid regular (if still comparatively low) salaries, and include correspondents from the Balkans to China. The shoestring budget is supplemented a little by the bustling tazpresso Café on the ground floor, which offers the day’s edition to anyone drinking the newspaper’s fair-trade, organic blend of African espresso. At the unveiling of Rudi-Dutschke-Strasse, about 500 supporters marched good-naturedly from the taz to the intersection where the street passes the towering Springer building, complete with banners and homemade posters celebrating Dutschke and taunting the Springer empire (which didn’t find the Dutschke street initiative in the least funny and did everything in its considerable powers to stop it). On an elevated wooden platform, Dutschke’s 28-year-old American-raised son, Marek, the spitting image of his intense, dark-featured father, thanked the taz for the street. In fact, the Federal Republic has more than a renamed street for which to thank the Tageszeitung.